Our aim is to understand the customer as much as possible to find out the right service for him, unveil their needs even before there were means available to satisfy them. The document below is our particular vision, which includes a part that we'll preserve as immutable and another that is challenging to stimulate progress and encourage initiative and creativity. The current environment requires to accept continuous change as common, so this view becomes the backbone of any organization in order to get unity of effort and resources concentration to leverage its core capabilities optimally. 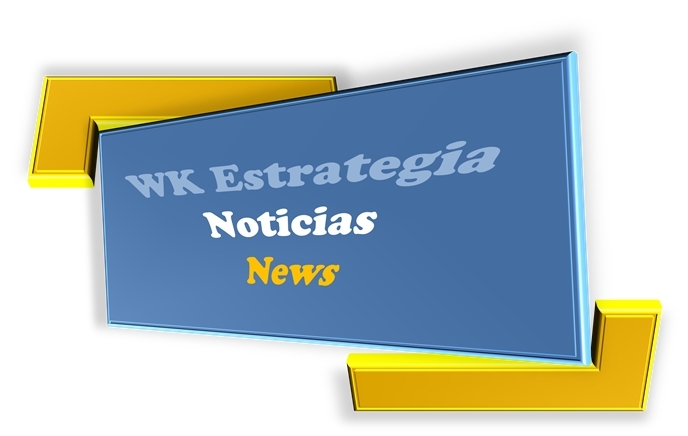 If you need more information about what WK Estrategia can do to help you, please send us an e-mail to [email protected], or click on "contact"
The WK Estrategia basic commitment is to introduce theory and practice without gaps between them, so that, we have a pragmatic approach oriented to application, and we truly believe on our capability to distinguish when rules, standards or proceedings are obsolete and could become jailers instead of facilitators. We start with a true premise, the uniqueness of any organization, bearing in mind a clear aim: satisfaction of clients expectatives, learning from what happened and how it has been done; what's happening and how well are we doing and finally, what will happen out there and how the organization must be governed from now on to reach its goals. We will work closely with our clients to fully understand how they do business. We don't use big and pompous statemets and grand theories, because we know that beyond them, the details of practice are laying in wait, and attention must be paid to learn how to tease out the errors hidden in performance gaps. Our methodology is dynamic. We will help our clients to improve their business management and to grow better leaders. We also help corporations do not emphasize solving short term problems while blessing unexpected successes and cursing disasters wasting in both cases emerging opportunities to improve and mastery to get. We wil help to keep on track what it is really important over the long run, what is to perform their mission and to get their vision. If you need a plan and want to reach maturity in the "Strategic Management Process"
If you want to keep an overview that makes you aware of your situation, and a focus on results that favors unity of effort using resources, we can help to make ad hoc depictions to represent the most important metrics in order to engage all the organization’s components and communicate effectively your organization's strategy goals. 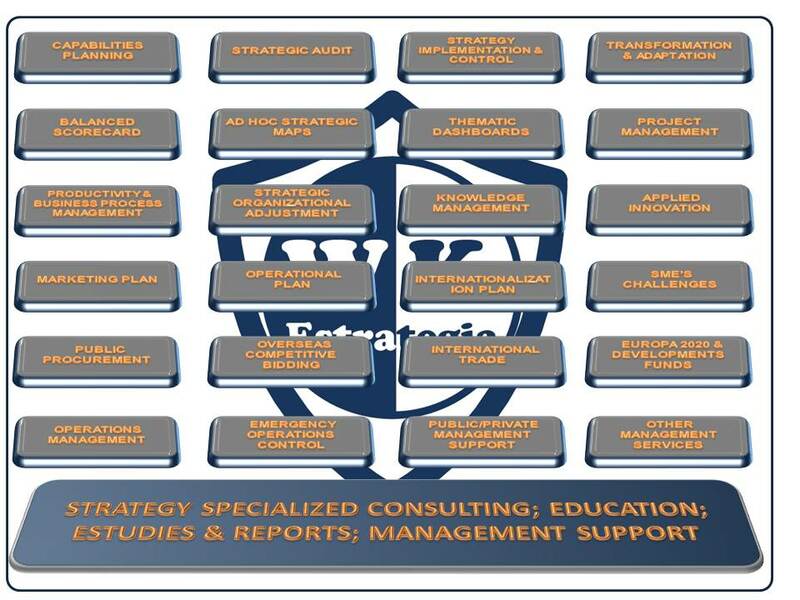 If you need to implement your strategic formulation we help you in "Management Control"
If you want to "transform" according to the degree of change required, beyond borders, whether geographical or otherwise. If you want to be good preparing and using your skills and do it better than competitors, we help you in "Operations Management"
Or want that your strategic projects leverage strategic outcomes and business as the best, we help you in "Project Management"
Or want to explore, identify, create and integrate specific knowledge to exploit it efficiently and effectively, we can help applying our integrated method of "Knowledge Management"
Or want to find niche markets where others only see cliffs, or need to master key management areas, more specifically: Marketing, Productivity, Innovation and Structure. 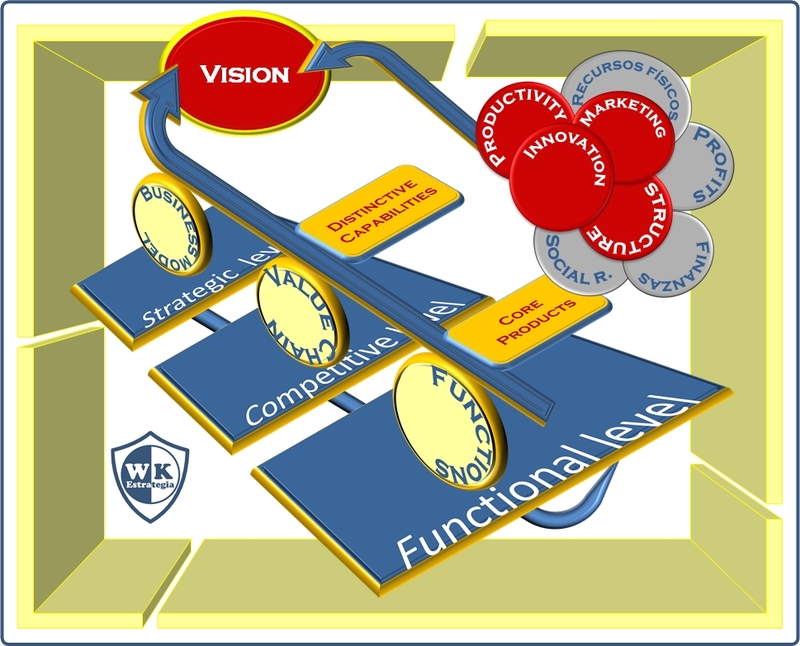 To have a quick overview of our unique value proposition for you, please go to "Web Tour"
The following depiction shows simply our overall approach on this matter.